4 Bdrm Detached Bungalow. V/bule. Reception hall. Lounge. Family rm/Dining kitch. Kitch on open plan. Dining area on semi-open plan. Utility rm. Bathrm. 4 Bdrms. Shower rm (CT Band - F). Garden. Parking. 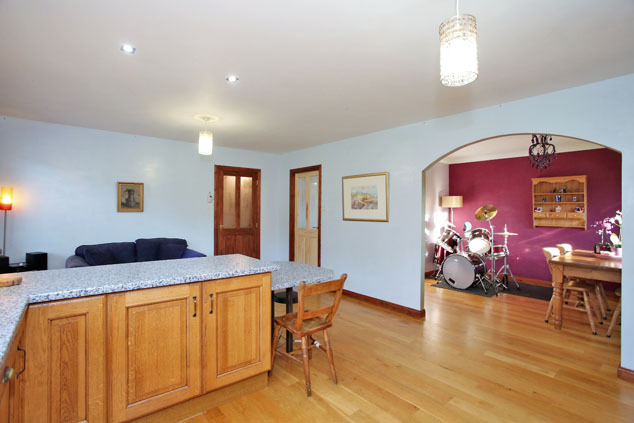 Fixed price £257,000 Entry by arr. Viewing 07554 431206 or contact solicitors. Below Home Report Valuation (EPC band - D). 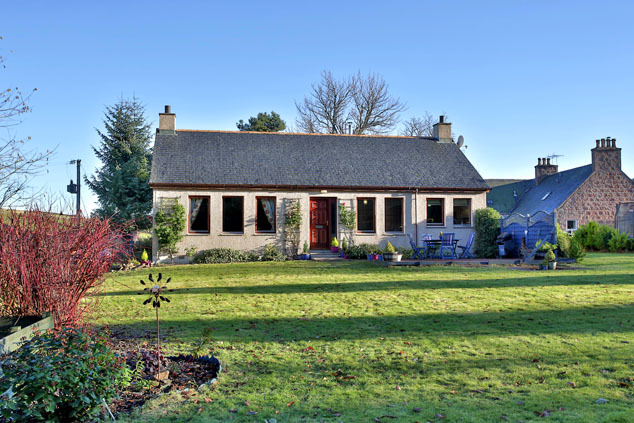 Situated in generous garden grounds, this four bedroomed detached bungalow enjoys an idyllic rural setting with views across the open countryside. 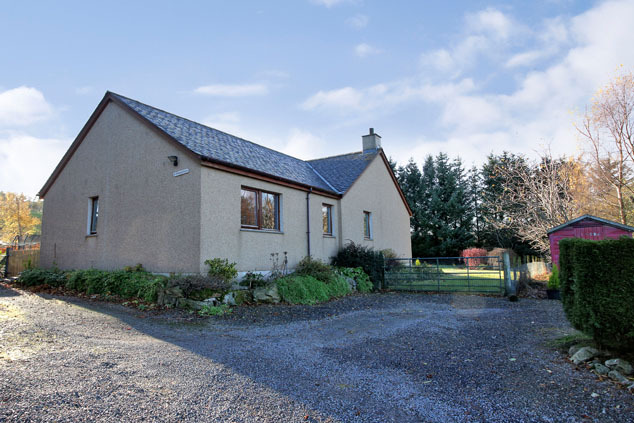 The property offers light and airy accommodation throughout, the bright vestibule leads to a welcoming reception hall, a generous lounge features triple windows with open views, the well appointed dining kitchen is served by a separate utility room and enjoys an open plan layout with the family area which in turn leads to a spacious dining area. 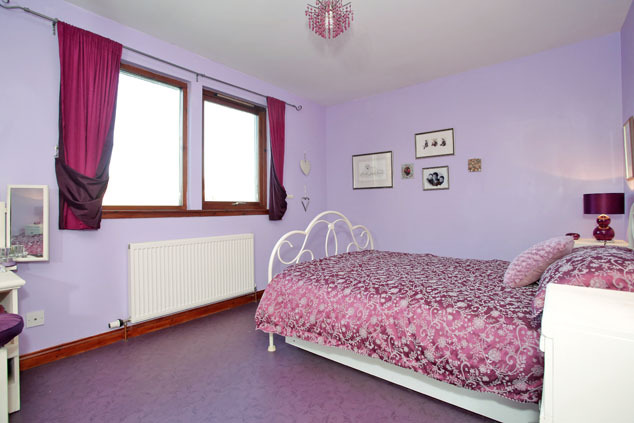 There are three well proportioned double bedrooms and a further good sized single bedroom. 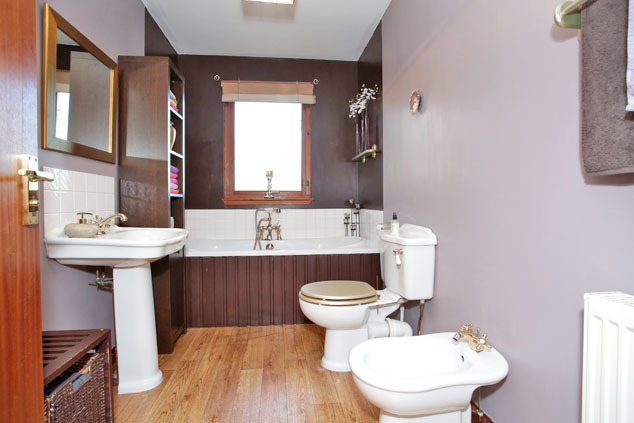 The property is further enhanced by a large family bathroom and separate shower room. Outside, the established gardens are mainly laid to lawn with decorative borders stocked with a variety of seasonal plants and shrubs. A driveway provides ample off-road parking. 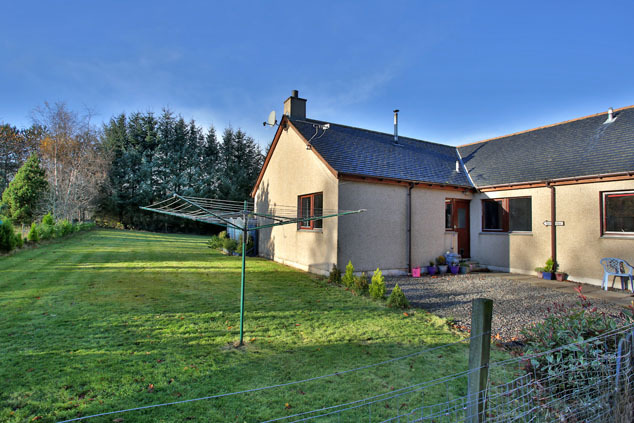 Viewing of this attractive family home is highly recommended to appreciate the location and accommodation on offer. 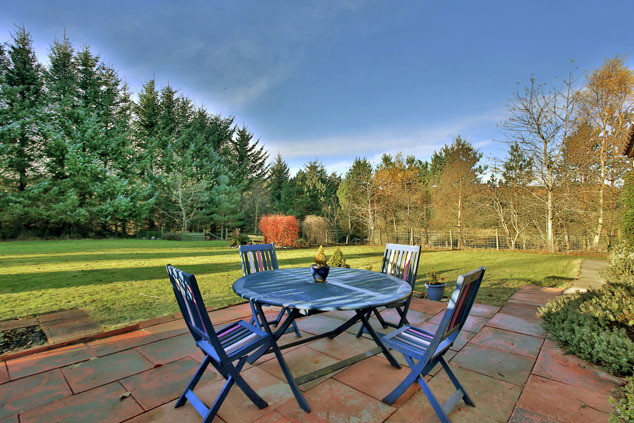 Lumphanan lies just 23 miles west of Aberdeen and within easy access of the nearby towns of Banchory and Aboyne where there is a comprehensive range of shops and several excellent hotels and restaurants. Primary education is catered for in the village with Secondary education available at Aboyne Academy with a school bus service in operation. 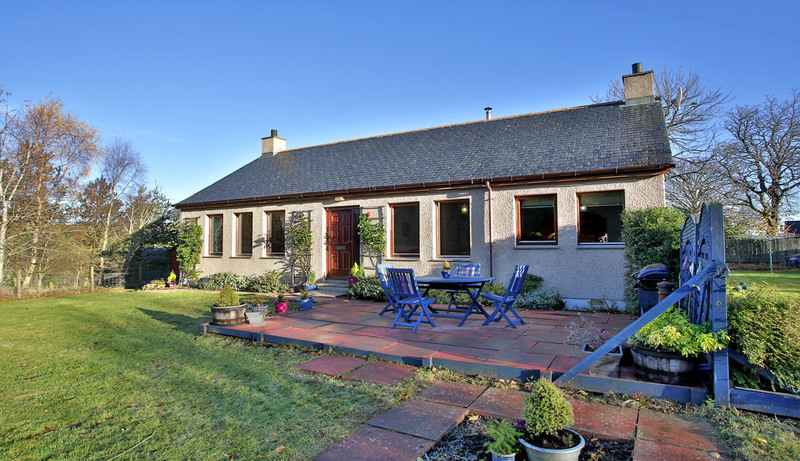 A range of leisure pursuits includes a 9 hole Golf Course and new Club House in Lumphanan and, in nearby Aboyne a Community/Sports Centre and swimming pool. Vestibule Entered via a hardwood exterior door with opaque glazed section alongside, a part glazed door leads to reception hall. Ceiling coving. Reception Hall The spacious hallway provides access to most accommodation. A deep fitted double cupboard provides shelved storage facilities and houses the electricity fuse box and meter. A further fitted cupboard houses the hot water tank and shelved storage space. Hatch to loft space. Ceiling coving. Smoke detector. Lounge 18’2” x 13’8” [5.55m x 4.15m] approx. 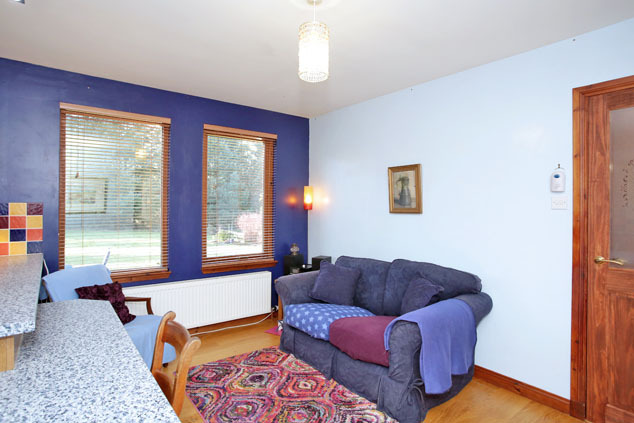 An exceptionally light and airy room with triple windows overlooking the mature gardens to the front of the property. Ceiling coving. TV and telephone points. Dining Kitchen/Family Area 19’4” x 13’5” [5.90m x 4.10m] approx. 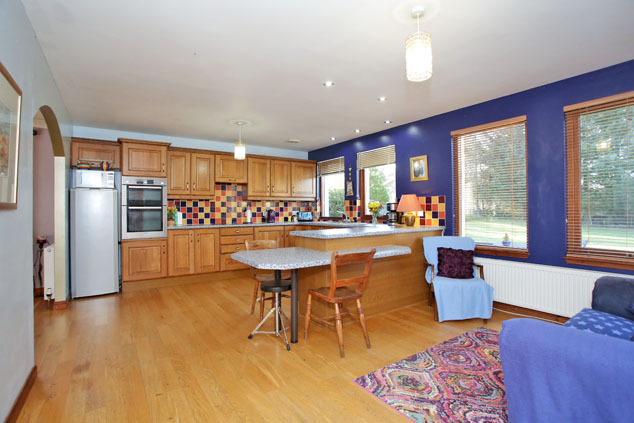 Entered via a part glazed door, this generous lounge features a large family area on open plan with the dining kitchen. The kitchen area is fitted with a range of wall and base units incorporating roll front work surface with extensive splashback tiling. 1.5 bowl Asterite sink with mixer tap and drainer. The integrated halogen hob with extractor hood, double oven/grill and dishwasher will be included in the sale. Space for a free standing fridge/freezer. A peninsular base unit separates the kitchen from the family area and provides ample breakfast bar seating. There are four windows flooding the area with natural light. 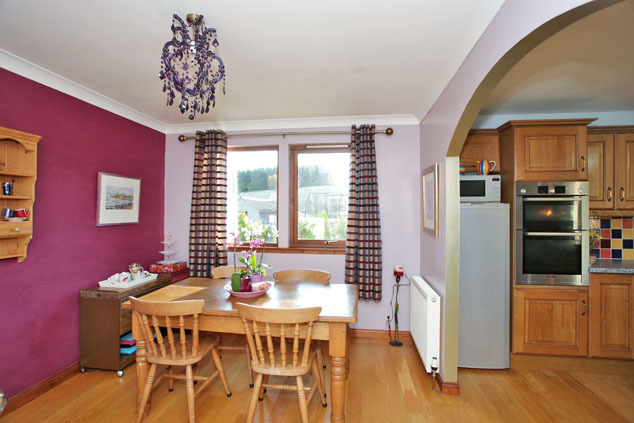 An archway leads to the dining area and door to utility room. Solid wood flooring. Dining Area 13’9” x 9’9” [3.95m x 3.00m] approx. Enjoying a semi open plan layout with the kitchen, the spacious dining area offers ample space for a range of furnishings. Twin windows to the side. Solid wood flooring. Ceiling coving. Utility Room Accessed via the family area, this useful space is fitted with additional wall and base units incorporating work surface with splashback tiling, stainless steel sink with mixer tap and drainer. Space for a washing machine, tumble dryer and freezer. Wall mounted central heating boiler and controls. Part glazed door with window alongside to rear gardens. Xpelair. Family Bathroom 10’5” x 5’11” [3.20m x 1.80m] approx. 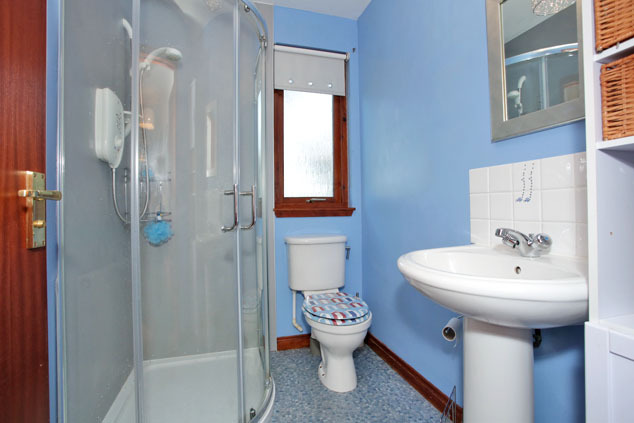 Fitted with a white suite comprising w.c., wash hand basin, bidet and bath with shower attachment to taps. Splashback tiling behind the wash hand basin and around the bath area. Opaque window to rear. Xpelair. Bedroom 1 13’3” x 9’10” [4.05m x 3.00m] approx. 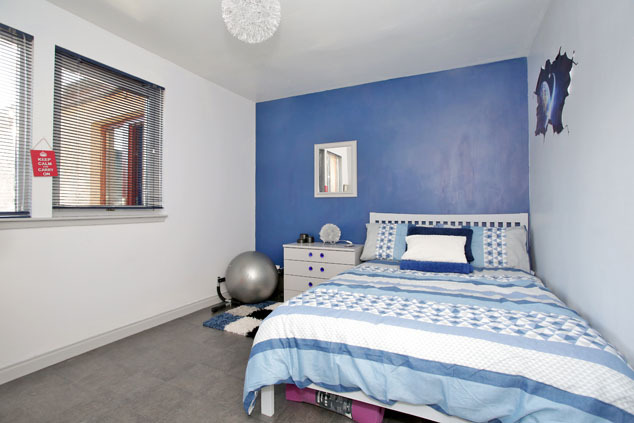 A generous double bedroom with twin windows to the side of the property boasts a superb open outlook. 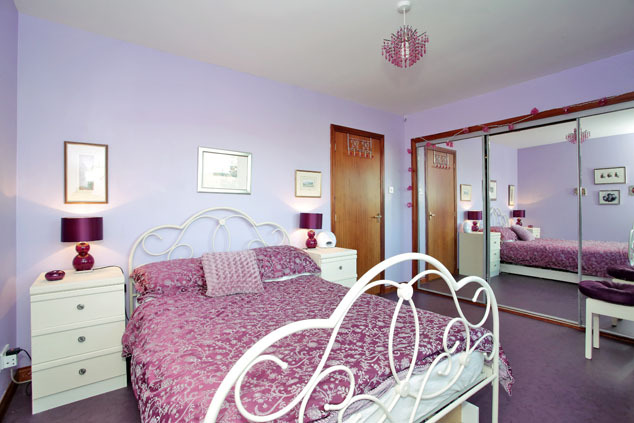 Triple fitted wardrobes with sliding mirror doors provide excellent shelf and hanging facilities. Bedroom 2 11’8” x 9’10” [3.55m x 3.00m] approx. 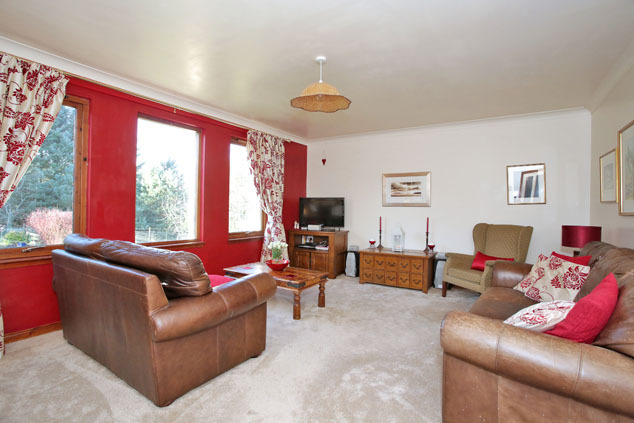 A further double bedroom with open views to the side of the property. Fitted wardrobe with shelf and hanging space. Bedroom 3 10’1” x 9’10” [3.10m x 3.00m] approx. 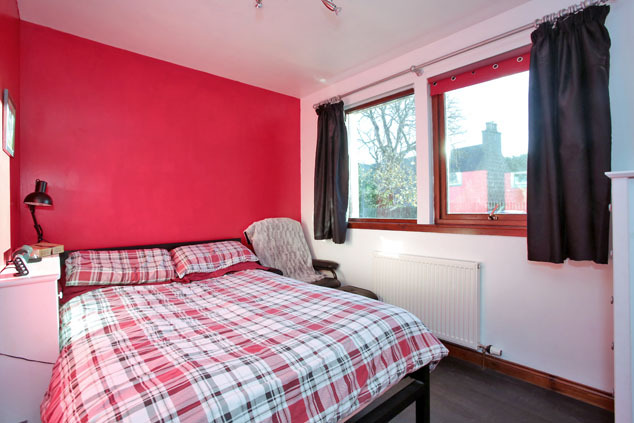 at widest A bright double bedroom overlooks the side garden and benefits from a fitted wardrobe with shelf and hanging space. Bedroom 4 10’5” x 9’5” [3.20m x 2.90m] approx. 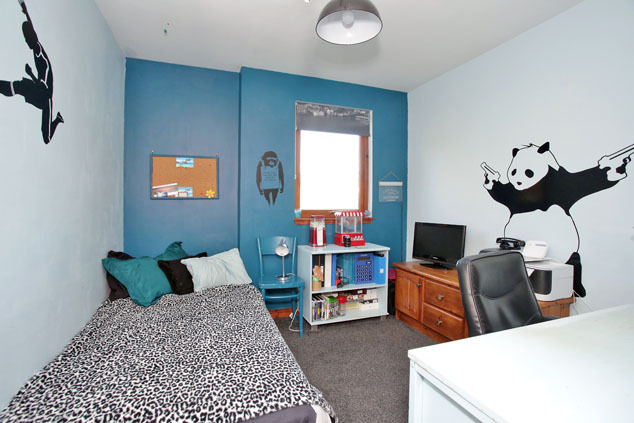 Overlooking the side of the property, this large single bedroom is currently used as a study and provides ample space for a range of free standing furniture. Telephone point. Shower Room Fitted with a white suite comprising w.c., wash hand basin with splashback tiling and fully aqua lined shower enclosure housing a Mira shower. Opaque window to the side. Xpelair. 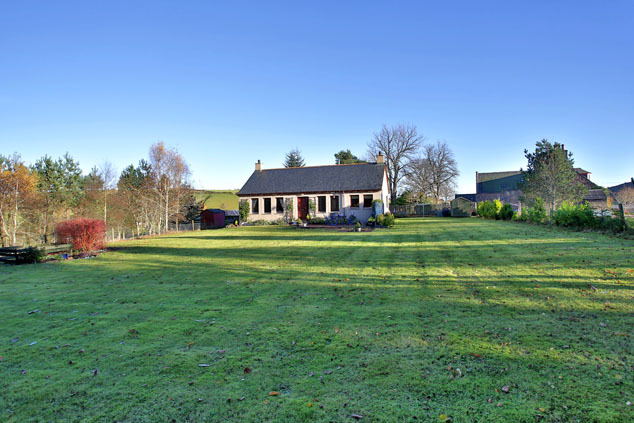 Outside Enjoying a superb rural location with stunning open views of the surrounding countryside, the property is set within extensive garden grounds which are mainly laid to lawn bounded by a post and wire fence along with established conifer trees. A private stone chip driveway provides off-road parking for several cars and leads to the rear of the property. A gated entrance and stone chipped path leads to the rear entrance with a paved path continuing round to the front of the property. The front of the property boasts a lovely south/west facing aspect with a raised paved patio providing the ideal location for outdoor entertaining. Directions Travel on the A93 towards Banchory. In Banchory turn right at the junction signposted for Torphins the A980. At the crossroads, turn left onto the A980 signposted for Torphins/Alford. Continue along this road and turn left at the B9119. Continue for some distance on this road and take the turning on the right signposted for Leochel-Cushnie, then take the fist left as indicated by our For Sale board and follow the access road to the left towards Pittenderich. 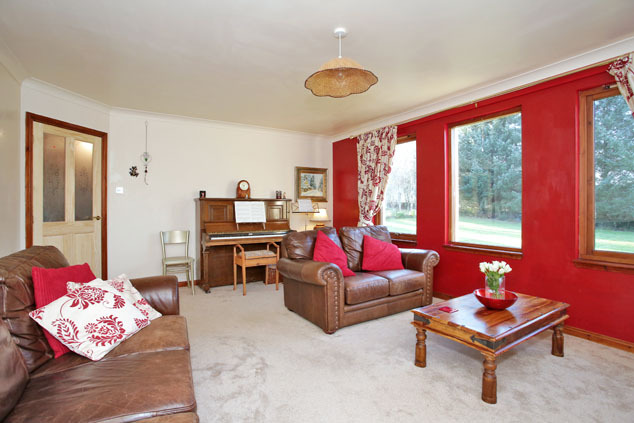 Notes The property benefits form oil fired central heating and double glazing throughout. Private water supply with drainage to a septic tank. EPC=D. All carpets, light fittings and some curtains will be included in the sale along with the integrated white goods. The date of entry is material and offers subject to survey, subject to finance or subject to the sale of the purchaser's own property will not be considered.